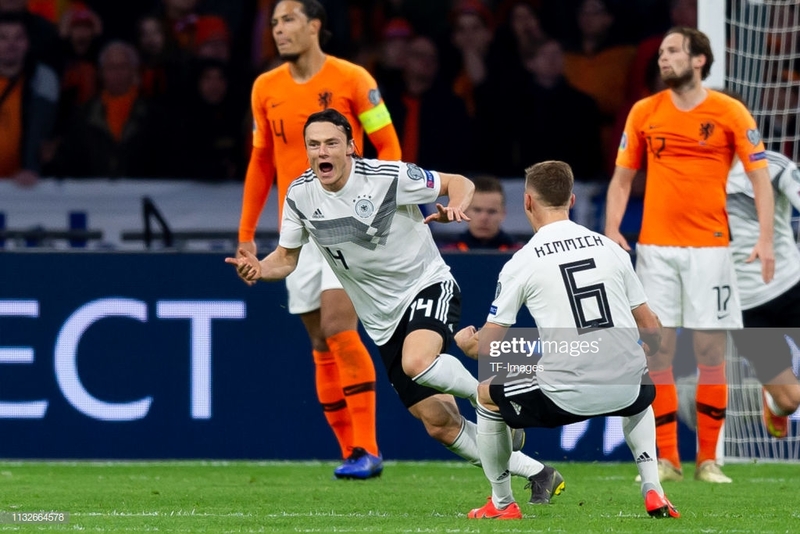 Reciprocal learning has been a feature of the footballing relationship between the Netherlands and Germany for much of the past four decades. They have learned from one another, as one has risen, the other has so often fallen. It has seemingly been impossible for both to be in fine form at the same time. Currently, it is the Dutch enjoying a renaissance whilst Germany struggle with a somewhat crisis of confidence. And in a microcosm, this match only highlighted the current situations that both sides find themselves in. Although Germany got the victory and three crucial points to start Euro 2020 qualifying, they slacked in the second half, letting a two-goal lead slip, showing their fragility. But a late winner got the visitors out of jail and despite the growing confidence and expressiveness that the Netherlands are showing, they were served a cold slice of the ruthlessness that exists at the top-end of international football. Joachim Low, who clearly has the faith of the German FA but not the rest of the country, decided not to start either Marc Andre-ter Stegen or Marco Reus despite both being in the best form of their lives. Rather Low opted for Manuel Neuer in goal and elected not to start a proven striker by putting Leon Goretzka in behind Leroy Sane and Serge Gnabry in a 3-4-1-2 formation. Ronald Koeman, on the other hand, can do no wrong and with a starting selection featuring Virgil van Dijk, Matthijs de Ligt, Georginio Wijnaldum, Frenkie de Jong and Memphis Depay at the Johan Cruyff Arena, it is easy to see why. The Netherlands had only lost once in 12 months and, although that didn’t include a World Cup appearance last summer, the national team seem to be reaping the rewards of promise becoming proven talent earlier than expected. Ahead of this international break, Low decided that none of Thomas Muller, Mats Hummels and Jerome Boateng would be called up again within his tenure. Their exclusion from the first team was part of what Low labelled ‘a break from the past’ but to be able to move forward without them, there must be players worthy ahead of them. One German football expert provided the verdict this week that the national team are currently in between generations, unsure which to go with. It makes sense for Low to choose the younger and hungrier who will form the teams of the future; at the moment he is choosing the middle ground. Coming from an underwhelming friendly draw against Serbia four days previous, Germany needed to make an impact early on. They certainly settled quickly, playing a more fluid system, and dictated the pace of play. An early goal was what the visitors would have wanted the most, and managed to get one before 15 minutes had past. Toni Kroos, who has shown indifferent form with Real Madrid this season, displayed his quality with the ball as he sent a perfectly weighted pass forward into the path of Nico Schulz. The Hoffenheim left back drove down the flank and sent the ball into the area. Sane controlled, took a step to the left of the slipping De Ligt before firing past Jasper Cillessen. With Germany in the lead and playing out from the back, Koeman urged his side to press more aggressively. Depay, Quincy Promes and Ryan Babel all demonstrated tremendous energy and were well supported from midfield by Wijnaldum and Marten de Roon. Soon enough, the hosts were getting closer to Neuer’s goal. Babel found himself at one with the German goalkeeper deep in the penalty area but shot too close to Neuer spurning a good opportunity. Two minutes later, Denzel Dumfries sent a ball in from the left and again Babel fired a shot at goal, but this time his volley was straight at Neuer who didn’t have to move. Either side and it would have been the equaliser. As the game moved past the half-hour mark, the Netherlands were left to rue their missed chances. Van Dijk had so far shown that he is as cool, calm and collected in orange as he is in red, but when he allowed Gnabry too much room to come in on his right foot, the German winger took full advantage and curled a ferocious shot into the top left corner of Cillessen’s net. The visitors finished the half strongly and with Thilo Kehrer heading down the throat of Cillessen and Sane firing a low shot that was also saved by the Dutch keeper, they would have felt a more handsome scoreline was deserved going into the break. Less than two minutes into the second half, however, Germany’s lead was reduced to a single goal. A short corner routine looked like it had fizzled out but Depay got a second chance to whip in a flat delivery and with a helping head from De Ligt, the Netherlands were back in the match. It was now the turn of the hosts to show their capabilities in an attacking sense. When Wijnaldum latched onto a dinked through ball just after the hour mark, it felt that an equaliser was coming. Neuer and the linesman denied the Netherlands on that occasion, although the latter did so incorrectly. Yet when Depay fought his way into the area moments later he managed to manufacture space to release a shot which no one could stop. It was too quick and too precise, much like the Netherlands in the second period. The Dutch were now dominating, the dynamics reversed, thus begging the question as to how much of Germany’s first half lead came as a result of the hosts not quite being at it. The Dutch pushed for a winner but couldn’t quite manage to exert late pressure on Neuer’s goal. With the game heading towards a draw, Low sent on Reus and his substitution proved inspired when the Borussia Dortmund midfielder picked out Schulz in the area who applied a one touch finish to push the ball into the goal. It was enough to get Germany out of jail and leave the Netherlands frustrated. It showed that Koeman’s young side still have plenty to learn.